Wink Bingo is a fun and flirtatious bingo site. You can enjoy great bingo, make new friends and maybe even win a gloriously huge progressive jackpot … all in the wink of an eye. Wink Bingo is easy to cuddle up to, with, as we’ll see in our Wink Bingo Review, a simple sign up process and convenient home page access to upcoming games. If you are new to online bingo and need a little extra help, just head straight for the Wink Bingo help videos. Short and sweet, they guide you through every step of the “getting started” process. Then you’ll be all set to fill in the few details requested for registration – no need to give any financial information at this point – pick your game and begin to play. Choose your favorite from among the games on offer or have a fling with something new. There’s the sturdy British standby, 90 Ball Bingo, and its dashing American cousin, 75 Ball Bingo. Or how about some Scandinavian intrigue with Swedish 5 Line Bingo? Whether the object of the game is to complete one line or five, to cover shapes or the entire card, the name of the game is having a good time. And if your idea of a good time is rolling in lovely loot, then go for one of the progressive jackpot bingo games, with their dazzlingly high payouts. When you want a break from bingo, step out with blackjack, slots or an instant win game. Variety is the spice of life! Wink Bingo welcomes you with open arms, showering you with a 200 percent match bonus on your very first deposit. Then Spin the Wheel to win more bingo funds – £15 is guaranteed, but you just might be swept off your feet by a dashing £1000 prize. After that, your relationship with Wink Bingo will continue to be a whirl of goodies, like great payouts, free bingo cards, doubled jackpots, guaranteed prizes and much more. You’ll automatically be eligible for the loyalty program, which rewards you with points for purchases, bonus points, cash back on all the games you play, reload bonuses and refer a friend bonuses. 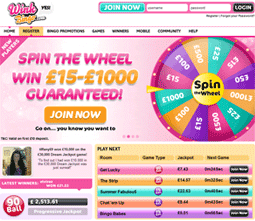 Wink Bingo, owned and operated by 888 Holdings, is licensed in Gibraltar as part of Cassava Enterprises. Wink takes good care of you, protecting your personal information online with state of the art 128 bit SSL (Secure Sockets Layer) encryption technology. The friendly folks at Wink Bingo have set up an FAQ section especially for you, to answer any questions you may have. If you would like to speak with a real live person, contact Wink’s customer support agents 24/7 through live chat either from the website or right inside the bingo room, email or telephone (toll free within the UK).